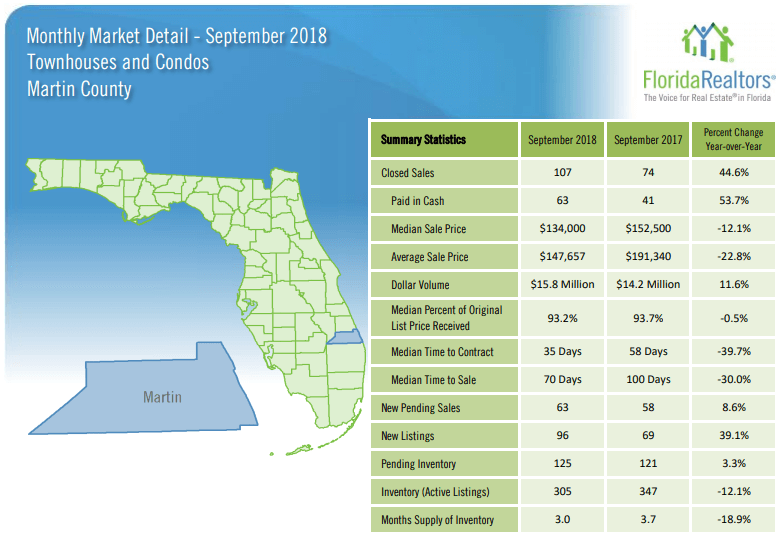 Martin County Townhouses and Condos September 2018 Market Report showed weaker sales activity when compared to September of 2017. Closed sales for the month were down by 24.1% (was down by 7.0% in August) while new sales under contract (new pending sales) were down by 7.8% from September 2017 (decreased by 16.5 in August). Prices, however, continue to rise significantly. The median sales price increased by 13.3% (was up by 27.5% in August) while the average sales price increased by 24.0% (was up by 34.8% in August) as compared to September of 2017. The inventory of available townhouses and condos decreased by 20 units to 299 properties as compared to last month. This is 14.8% less inventory then the September 2017 data. Currently, there’s a 3.0 month supply of inventory (compared to 3.7 months for September 2017). Remaining in a strong seller’s market for townhouses and condos in Martin County. A balanced market favoring neither buyers or sellers is considered to be one with a 6 to 7 month supply of inventory.